Unfortunately this weekend I was feeling a super fatigued. I worry a little about being a Vegetarian in paris…. many times there isn’t a significant amount of protein in vegetarian options (just cheese) or restaurants just look at me funny when I ask what vegetarian options they have…. This weekend I was super sleepy and had fits of a headache and never-ending hiccups. I made sure to eat lots of eggs and peanut butter, and drink protein-rich soy milk!! So, for my Paris-Cinéma class, one of our assignments was to go to a local cinéma and write about the history, experience, etc of the cinema. I chose l’Épée de Bois on famous Rue Mouffetard because it’s the closest one to me. They offer a selection of movies, most of them are french, but there are a few international ( English, Canadian, and American). 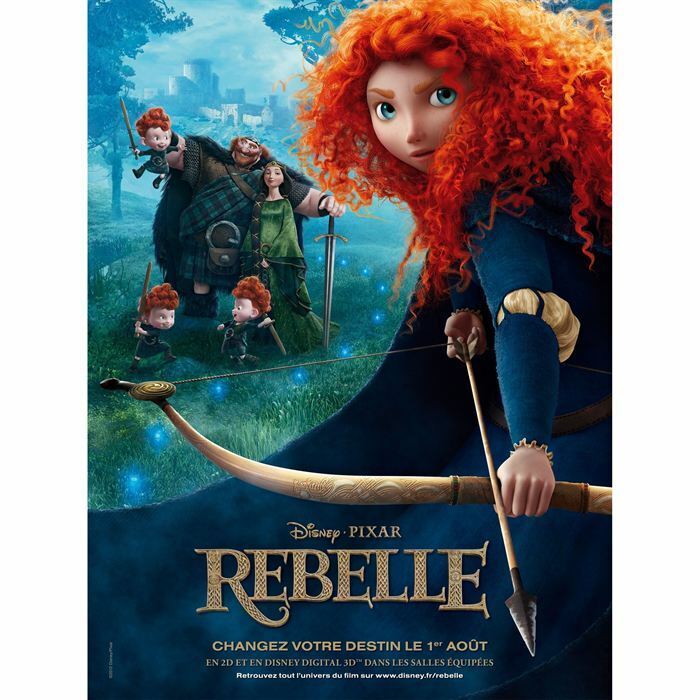 I chose to watch Rebelle…. (better known as Brave in America). I thought with an animated film I would be able to understand it easier. What I loved about the experience was the adorable little kids in the theater laughing hysterically!!! It was absolutely adorable. I somewhat regret choosing this film because while the story line was easy to follow, it was dubbed in French, so the mouth movements of the animated characters didn’t match the sounds they were making… so lip-reading wasn’t an option. I did however find it to be a nice pixar / disney film! To be honest, I actually prefer the French title to the American one…. She is truly more of a Rebel and a personification of Brave…. For this class we have to give a presentation on the history of the cinema and the experience. I chose to use Prezi instead of traditional powerpoint because I think it adds a little something extra. I am still debating if I add photos from the theatre to the presentation, I probably will so the link will change, but for the time being you can check out the presentation here. Click the little arrows at the bottom to go from frame to frame. By the way… it’s in French. What else did I do this weekend?? Well with Travel and EDUCO cultural events in the upcoming weeks I made this a productive weekend: I managed to write two papers in entirety (and an outline of a third one; subjects are: biography of El-Hadj Omar, analysis of an excerpt of Le Ventre de Paris by Émile Zola, and fim critique of Amélie ) as well as finally finish Freud’s Studies on Hysteria (yeah… I opted to read it in English instead of French…), visit the Louvre (again), and make French Toast in a Mug in under 3 minutes! !